It was mid-May 1862 when Jefferson Davis of Mississippi came to the great crisis of his life. Davis had devoted his existence to serving his home state and his country, and that path had led him to the presidency of the Confederate States of America. Yet a lifetime of labor and commitment to principle had brought him no repose to enjoy his accomplishments. Indeed, in that spring of 1862, he found himself standing not on a pinnacle of power but a precipice of defeat. His world appeared to be on the verge of collapse, and he was virtually powerless to stop it. By mid-May 1862, newspaper editors across the divided nation openly declared that Davis's battered Southern Confederacy was doomed. Confederate troops had triumphed in the war's first major battle, at Manassas, Virginia, in July 1861, but since then the litany of Southern defeats was long and almost unbroken: in Tennessee at Forts Henry and Donelson and at Shiloh, in Arkansas at Pea Ridge, in North Carolina at Hatteras, Roanoke Island, and New Berne, in Georgia at Fort Pulaski, and in Louisiana, where New Orleans, the South's largest and wealthiest city, lived under Federal martial law. In Virginia, an army of more than 100,000 Federals, the largest army in American history to that point stood just 25 miles from Richmondthe Confederacy's capital and its leading industrial city. 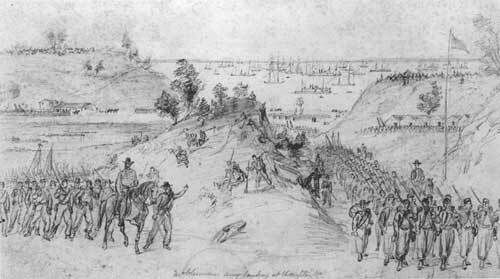 Richmond's defense depended upon an army of 60,000 inexperienced and poorly organized troops. Few disagreed when on May 12, the New York Times declared: "In no representation of the rebel cause is there a gleam of hope." It was in an atmosphere of desperation, therefore, that President Davis convened his Confederate cabinet in mid-May. Davis asked these men to consider the Confederacy's last ditchwhat should they do if Richmond were lost? Present at the meeting was Davis's military adviser, General Robert E. Lee. Lee was a Virginian. His mother's father had been one of the wealthiest landowners in the state. Lee's own father had led troops under Washington in the Revolution and had served as governor of Virginia. The fate of Richmond was therefore of more than professional concern to the 55-year-old soldier. He courteously advised the president that if Richmond fell, the next militarily defensible line in Virginia would be along the Staunton River, about 100 miles southwest of the city. Then, much to the surprise of the men present, Lee added a personal opinion, almost a plea: "But," he said, in a firm voice, "Richmond must not be given up"; tears welled in his eyes, "it shall not be given up!" Coming after months of Southern defeats, Robert E. Lee's emotional declaration stands as a watershed in the early history of the Confederacy. Jefferson Davis's dedication had been powerful and unwavering in the first year of the war, but the South's oft-defeated generals had been at best merely competent. Lee's ardor on behalf of Richmond and all it symbolized suggested that perhaps he was a different kind of soldier. Here was a military man who seemed touched by powerful, even passionate determination. Within six weeks, the courtly Virginian would reveal for all to see another side of his charactera boldness and decisiveness that would very suddenly turn defeat into victory and completely reverse the course of the war. 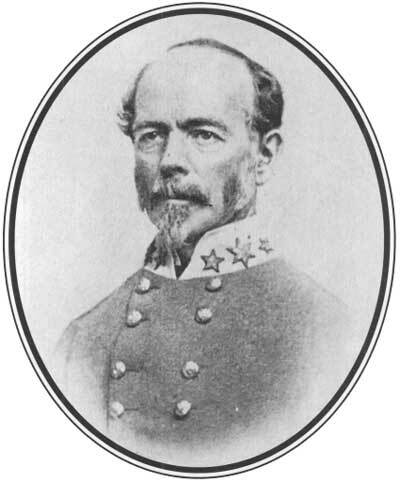 Before Davis appointed Lee to be his adviser in mid-March 1862, all of the military problems of defending Confederate Virginia were laid at the feet General Joseph F. Johnston. Small, trim, and meticulously neat, the 55-year-old Virginian was a career soldier. Though popular with his men, Johnston was proud to the point of perceiving slights where none existed. After the Confederate victory at the Battle of Manassas on July 21, 1861, a victory that owed much to Johnston's leadership, the general seemed jealous of credit going to anyone but him. Relations between Johnston and his civilian superiors in Richmond were stormy, and the general and President Davis seemed to be as much private adversaries as public allies. Perhaps worse than his strained relations with Davis was the condition of Johnston's army. In April and May of 1861, a great many Southerners had enlisted to fight for one year. Those enlistments would expire in the spring of 1862 with the war far from won and as the Confederacy was to face its greatest crisis. The Confederate Congress passed a conscription actthe first in American historywhich drafted recruits and forced current soldiers to remain in the ranks. The veterans were outraged, and morale and discipline declined. Greatest of all of Johnston's concerns, however, was the position of his army. 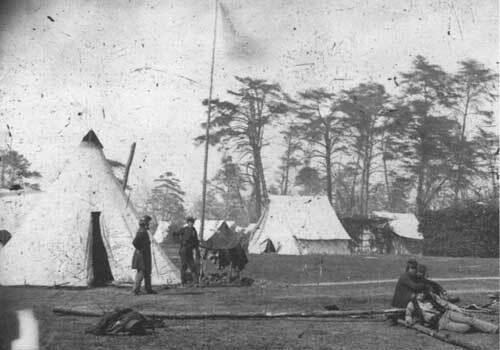 His troops had spent the winter in camps around Manassas, a railroad town about 30 miles west of Washington. By spring 1862, Johnston could marshal only about 42,000 men and worried that the Northerners would discover his weakness. In February, Johnston conferred with Davis about pulling the army back from its advanced position to a defensive line nearer the capital. The only results of the seven-hour meeting were confusion and hard feelings. 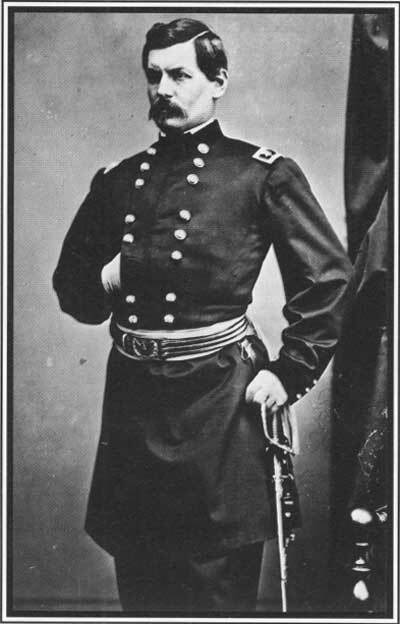 Davis later said he had directed Johnston to stay at Manassas as long as possible. Johnston believed he had discretionary power to withdraw whenever he deemed it prudent. The misunderstanding led to a widening of the breach between the general and the president, and as the battle for Richmond loomed in the spring of 1862, the two men remained more than ever disaffected partners in an unsteady alliance to save the Confederacy. But by the spring of 1862, the Federal army had grown so powerful that the Confederates' plans seemed almost unimportant. The size of the Federal Army of the Potomacmore than 200,000 menled many in Washington to think it virtually invincible. The great army's commander, Major General George B. McClellan, "The Young Napoleon," as the newspapers called him, was already the idol of his army and had many admirers among the people of the North and the powerful of Washington. If he took Richmond and ended the war, McClellan would be hailed as the greatest hero of the age, and he knew it. The mustachioed young generalhe was only 35was the product of Philadelphia society. Graduated second in his class at West Point, he had distinguished himself as a military engineer in the war with Mexico and after. His superiors saw him as a rising star and cultivated his professional growth, but despite his many accomplishments, the young captain grew impatient with the slow promotion and low pay in the army. He resigned in 1857 to begin a promising and initially highly successful career as a railroad executive. When the war came in 1861, George McClellan was considered brilliant and popular and had been extraordinarily successful in the army and in private business. It was logical that Northern leaders looked to him to lead troops when the war broke out. Just three months after the beginning of hostilities, President Abraham Lincoln called McClellan to Washington to sort out the confusion in the wake of the debacle at Manassas. McClellan arrived in Washington in late July 1861 to find a disorganized and defeated army of about 52,000 and a city full of politicians near panic. Radiating competence and self-assurance, the general soon calmed the hysteria. Within three months, he had 134,000 soldiers trained and armed around Washington, and the army was growing by the week. The Northern states demonstrated their tremendous power and commitment to the cause by sending tens of thousands of recruits and hundreds of cannon to McClellan so that by the end of December 1861 the Army of the Potomac numbered 220,000 men and more than 500 cannona force many times greater than the largest army in the nation's short history. President Abraham Lincoln watched this impressive performance by the young man and was inspired to give him even greater authority in directing the Union war effort. On November 1, 1861, Lincoln appointed McClellan to command "the whole army" of the United States. McClellan would be responsible not just for the actions of his own army, but for the movements of all the Federal armies in all the theaters of war. Lincoln expressed concern that perhaps the job was too big for his young general. McClellan's self-assurance seems to have had no bounds. He told the president, "I can do it all." But "Little Mac" had considerably less confidence in others. Washington politicians in general and the president in particular appear to have merited neither his admiration nor his trust. McClellan was a conservative Democrat in a town where liberal Republicans held power. Many Republicans wished to replace him at the head of the army with one of their own. That Lincoln was not among these seems not to have mattered to McClellan, for he clearly did not respect Lincoln as a man or a leader. The general was negligent in paying to Lincoln the courtesy traditionally due the president and on occasion referred privately to the commander in chief as a "gorilla." Matters of decorum aside, McClellan took pains to conceal from Lincoln and Secretary of War Edwin M. Stanton his plans for the spring campaigns. The general was understandably concerned about security, but by showing such disrespect for his civilian collaborators, who were also his legal superiors, he almost certainly undermined their confidence in him. As the winter weeks passed and the army grew, so did the outcry for McClellan to do something. Unfazed, McClellan developed with great deliberation his plan for a campaign he believed would end the war. His national strategy called for a simultaneous movement by Federal armies upon the heart of the Confederacy. 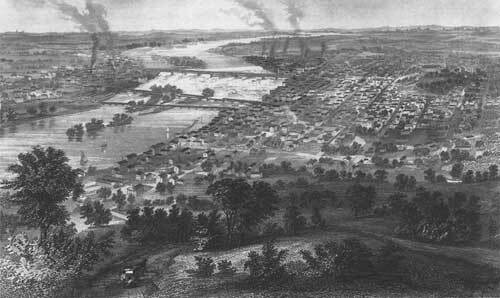 According to his plan, Nashville would fall, followed by all of Tennessee; Federal armies would secure Missouri and the Mississippi River, New Orleans, the Carolina coasts and, most important, Richmond. He thought the outcome by no means certain if the job was undertaken hastily. "I have ever regarded our true policy as being that of fully preparing ourselves, and then seeking for the most decisive result," he wrote the president. In other words, he wished no half measures; he wished to make one grand, overwhelming, and irresistible effort. By December 1861, McClellan, had sketched out a plan for a campaign in Virginiaa movement he would lead himself. His "Urbanna Plan" called for the movement of the Army of the Potomac from Washington, D.C., by water down the Chesapeake Bay to the river town of Urbanna, Virginia, on the Rappahannock River, 60 miles from Richmond. From Urbanna, the army would advance rapidly overland to Richmond. Despite his reservations, Lincoln approved McClellan's plan of campaign as long as the general would leave Washington secure in the army's absence. But in early March, two events occurred that completely altered the strategic picture in Virginia. A bright, clear Saturday, March 8, 1862, became the most dismal day in the 86-year history of the United States Navy. The Confederate ironclad Virginia, a vessel unlike any warship ever seen afloat, steamed out of its homeberth at the Gosport Navy Yard near Norfolk, Virginia, and attacked Federal ships in Hampton Roads. Three hours later, two Federal frigates lay destroyed and 250 U.S. sailors and marines were dead or wounded. The Virginia, scarcely hurt, would be ready to fight again the next day. Navy pride, however, would be redeemed on that morrow by the just arrived little gunboat USS Monitor. The historic clash between these two ironclads on March 9 ended in a draw, and the Virginia retired to her moorings in the Elizabeth River to refit and prepare for another day. It was the contemplation of another day like March 8 that dominated the thinking of Federal strategists for more than two crucial months that spring. Norfolk and its docks lay at the mouth of the James River. About 100 tortuous miles upstream sat Richmond on high bluffs overlooking the brown waters of the river that had helped make the city the South's leading manufacturing center. If the combined forces of the Federal army and navy sought a doorway to Richmond, the James was an obvious and very desirable optionbut not so long as the fearsome Virginia guarded the entrance to Richmond's river. McClellan had to look elsewhere for a route to the Confederate capital. Simply by its existence, therefore, this single Confederate shipthe ugly, turtlelike craft with balky enginesdominated the early phases of the Federal conduct of the campaign. The second pivotal event that March came when Johnston exercised what he believed was his authority to withdraw from Manassas. His army moved toward Gordonsville in central Virginia to a more secure position behind the Rappahannock and Rapidan Rivers, leaving or destroying more than 750,000 tons of food, thousands of tons of clothing and supplies, and dozens of heavy artillery guns at Centreville and Manassas. Davis was angry, not just that Johnston had evacuated his position but that he had been so hasty as to abandon food, supplies, and weapons precious to the Confederacy. The Confederates now sat on a railroad just several hours' ride from Richmond. McClellan realized that his cherished scheme of an amphibious sweep around the enemy's flank would no longer work as he had hoped. "When Manassas had been abandoned by the enemy," he wrote after the war, "and he had withdrawn behind the Rapidan, the Urbanna movement lost much of its promise, as the enemy was now in position to reach Richmond before we could do so." In the game of chess for control of Virginia, Johnston had sidestepped the expected Federal offensive yet remained in a fine position to react promptly to any Federal movement on Richmond. Johnston waited for McClellan's next move. McClellan, his generals, and the president finally agreed to proceed with plans for the now less-lustrous amphibious route down the Chesapeake Bay. The Federal commander planned to move to the Virginia peninsula formed by the York River on the north and the James River on the south. From Fort Monroe at the tip of the Peninsula, McClellan intended, with the help of the U.S. Navy, to force the small Confederate garrisons at Yorktown and Gloucester Point on the York River to retreat, opening the York to Federal shipping. 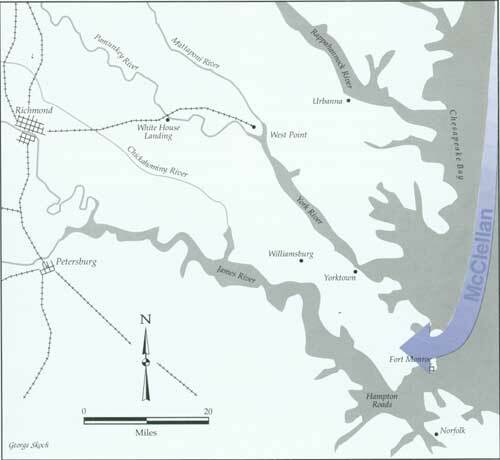 McClellan then hoped to move his army by water up the river to West Point at the confluence of the Pamunkey and Mattaponi Rivers. From West Point, McClellan hoped to move quickly westward along the Richmond & York River Railroad to the capital of the Confederacy just 30 miles away. General McClellan's original plan called for a landing at Urbanna on the Rappahannock River. From there the Army of the Potomac would march overland toward Richmond. The Urbanna Plan was quickly discarded, however, when General Joseph Johnston abandoned his position near Manassas Junction and ordered the Confederate army closer to Richmond. The move forced McClellan to revise his operation. He decided to land the Union army at Fort Monroe and march up the peninsula between the York and James Rivers toward Richmond. McClellan was confident of victory, for his army seemed irresistible. His host of 155,000 was the largest armed force in American history to that point. McClellan was confident of victory, for his army seemed irresistible. His host of 155,000 was the largest armed force in American history to that pointalmost four times larger than the entire American army in the Mexican War and seven times bigger than the largest force McClellan had ever commanded in the field. "The Young Napoleon's" move to capture Richmond was nothing less than the most enormous and complicated military operation in U.S. history and would remain so even into the twentieth century. On March 17, the first of McClellan's troops departed aboard ship from Alexandria, Virginia, and steamed down the Potomac. The Federals had assembled a fleet of 389 steamers and schooners to transport the army. For three weeks the waters of the Potomac churned with activity as the invaders shipped vast numbers of men, animals, cannons, and wagons southward. McClellan boarded a steamer at Alexandria on April 1 and cast off for his rendezvous with destiny. The general was deeply happy to leave behind the politics of Washington and join the army in the field. "Officially speaking," he wrote to his wife, "I feel very glad to get away from that sink of iniquity." But McClellan's troubles with Washington were just beginning. Lincoln had stipulated that McClellan must leave about 40,000 men behind to ensure that Washington was "entirely secure." McClellan reported he had left more than 55,000 men behind, but the War Department learned that only about 19,000 men remained to defend the capital and that 35,000 of the troops McClellan counted as defenders of Washington were 100 miles away in the Shenandoah Valley. The War Department immediately withheld 35,000 men slated to join McClellan, infuriating the general, who called the order "the most infamous thing that history has recorded." McClellan pushed onward from Fort Monroe toward the Confederate fortifications at the historic old town of Yorktown. Admiral Louis M. Goldsborough informed McClellan that the U.S. Navy could not assist him in forcing past Yorktown, so the general planned to outmaneuver the position and force the Confederate garrison to withdraw. 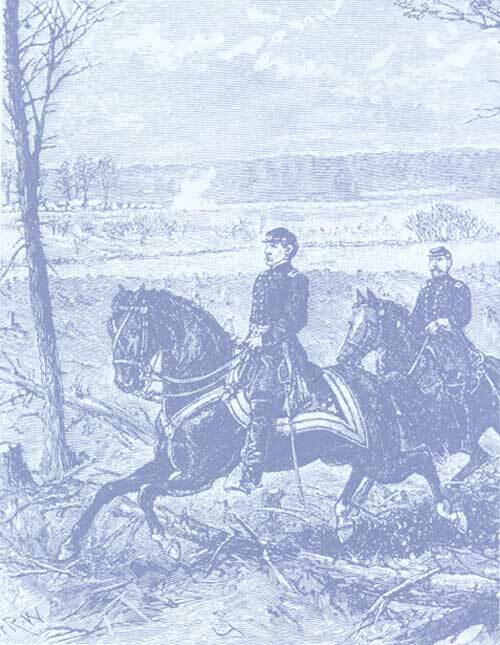 No sooner had McClellan's divisions moved forward than they encountered the unexpected. The roads, which McClellan had told the president were dry and sandy and passable in all seasons, were in reality small and muddy. The continuous passage of heavy wagons, artillery pieces, and thousands of men and horses churned the roads into morasses of mud. The "rapid marches" that had composed a significant component of McClellan's strategy, proved impossible, and every march became a slow essay in exhaustion for the men of the ranks. Even more fatal to McClellan's intentions was the discovery that his maps were grossly inaccurate. The general was stunned to learn that the Warwick River lay athwart his intended path and that the Confederates had constructed elaborate fortifications on the west bank from Yorktown to the James. 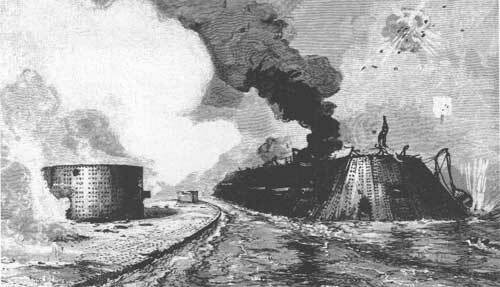 McClellan's chief engineer declared that the line of works was "certainly one of the most extensive known to modern times." More distressing to McClellan were reports that the Confederates were present in great strength across the Warwick. Federal officers reported seeing long columns of Southern troops moving about and clearly hearing the creaking and groaning of wagons and artillery on roads behind the Confederate front lines. McClellan's intelligence operatives reported that the Confederate garrison along the Warwick numbered perhaps 100,000, and the general decided that formidable works manned by so many defenders were impregnable to assaults by infantry. An engineer by training, McClellan had studied siege warfare and had brought with him dozens of enormous artillery piecesguns so large they could hurl explosive shells weighing 200 pounds more than three miles. The Federal commander knew that preparations for a siege would take many days, perhaps weeks, but he reasoned that even though he would be losing time, he would be saving lives. The Warwick River defenses were not nearly as strong as he thought they were. John B. Magruder commanded perhaps 13,000 Southern men in Yorktown and along the Warwick, but he made the most of them. A career soldier known among his brother officers of the old army for his panache and theatrical flair, Magruder staged an elaborate show for McClellan's scouts. Throughout April 4, Magruder ran his troops to and fro behind the lines, across clearings and along roads, always with a view toward being seen by the enemy. The newly arrived Federals counted many thousands of gray-clad soldiers and reported to headquarters that the Confederates seemed to be receiving heavy reinforcements. Magruder's bluff helped convince McClellan that the Confederates were much too strong to be dislodged quickly, and the Federals resigned themselves to bringing up their heavy guns. The high stakes of the Peninsula campaignthe fate of Richmond and with it, perhaps, the Confederacydrove leaders on both sides to seek every advantage in battle, including using some of the latest military technology on land, sea, and in the air. Probably the most famous new weapon of the Peninsula campaign was the ironclad warship. European naval engineers had experimented with ironclad ships, but not until the spectacular events of March 1862 in Hampton Roads, Virginia, did ironclads prove wooden warships were obsolete. The turtlelike CSS Virginia and the new USS Monitor, a "ridiculous-looking" vessel of radical design that one soldier thought looked like a cheesebox on a giant pumpkin seed, battled to an inconclusive draw on March 9, 1862, off the tip of the Peninsula. Their duel marked a turning point in naval history and revealed to the world that henceforth iron warships would rule the waves. Hot-air and gas balloons were not new in 1862, but technical problems had limited the military uses of airships. An energetic 29-year-old New Hampshire native named Thaddeus Lowe convinced both McClellan and President Lincoln that balloons could be of great value in aerial reconnaissance. Though Lowe had built and ascended in his first balloon just four years earlier, Lincoln made him chief of army aeronautics in August 1861, and the young Yankee went to work creating a fleet of balloons, the most famous of which was the Intrepid. He worked out a way to get portable gas generators into the field and took them to the Peninsula, where he immediately proved valuable. 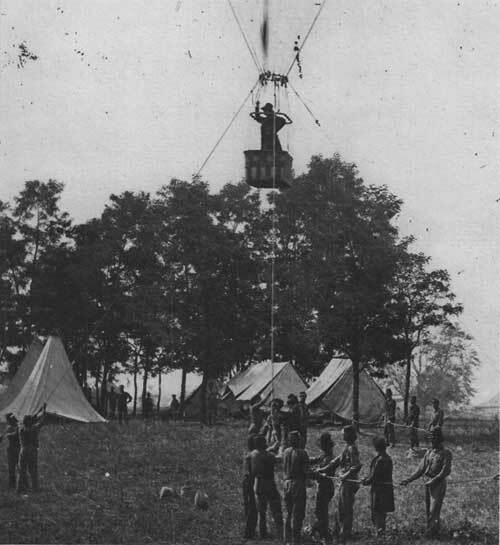 He and army officers made almost daily ascents to gather intelligence on Confederate positions, and Lowe became the first person to communicate with the ground from a balloon via telegraph. Brigadier General Fitz John Porter went aloft to observe Confederate activity at Yorktown when a tether line failed and winds bore the balloon westward over enemy lines. Southern marksmen tried to shoot the airship down, but the wind shifted and took Porter back to his blue-suited friends. Captain E. P. Alexander had charge of the Confederate aerial reconnaissance program, which enjoyed few of the advantages of its Northern counterpart. Lacking portable inflation machinery, the Confederates had to fill the balloon at the Richmond Gas Works, transport it by rail to the James River and tether it to a boatthe CSS Teasera bargelike vessel that was arguably the first aircraft carrier. American businessmen had been using railroads for decades before the Civil War, but not until the Peninsula campaign did military men see what the iron roads could do for armies actively engaged in field operations. McClellan made the Peninsula's one rail linethe small Richmond & York River Railroada linchpin of his strategy. The enormous Army of the Potomac consumed 600 tons of food, forage, and supplies each day, every pound of which had to come hundreds of miles from the North. Ships carried the food and supplies to the Peninsula, and wagons took the materiel into the army's camps. Using the railroad lifted a tremendous burden from McClellan's supply officers because it could quickly move tons of rations to within a few miles of the army's camps on the Chickahominy. So dependent did the Federals become on the rails that one Union general stated that the Army of the Potomac could not survive more than 10 miles from a railroad. The Confederates used the railroads most profitably by moving men. Five railroads converged at Richmond, and the Southerners brought troops over the rails from North Carolina and other parts of the Confederacy to defend the capital. Robert E. Lee's plan for a countermovement against McClellan late in June probably would not have been possible had not he been able to use the Virginia Central Railroad to move "Stonewall" Jackson's men rapidly from the Shenandoah Valley to Richmond. By far the most innovative use of railroads in the campaign sprang from Lee's fertile mind early in June. Lee directed Confederate military engineers to work with the C.S. Navy in mounting a powerful Brooke Naval Rifle on a flatcar. This gun could accurately fire 32-pound explosive shells more than a mile. The Confederates mounted the 7,200-pound cannon behind a sloping wall of iron affixed to the flatcar and rolled the armored railroad gunamong the first in historyinto action at the Battle of Savage's Station, June 29, 1862. The gun accounted for some Federal casualties, but its chief accomplishment seems to have been scaring Federal soldiers, many of them patients in a nearby field hospital, with the screech of its large shells. More controversial were the shells deployed by Confederate Brigadier General Gabriel J. Rains. Just before the Confederate evacuation of Yorktown, Rains ordered his men to bury large artillery shells a few inches underground around wells and in roadways and rig the devices to explode when stepped on. Officers in both armies were still chivalric enough to denounce the land mines as barbaric, and angry Federals used Confederate prisoners to find and excavate the "infernal machines." Of all the advanced implements of war used on the Peninsula, none better represented the terrible destructive potential of modern technology than Mr. Wilson Ager's volley gun. Of all the advanced implements of war used on the Peninsula, none better represented the terrible destructive potential of modern technology than Wilson Ager's volley gun. Like the more famous Gatling gun, this rapid-fire weapon was a direct ancestor of the modern machine gun and spat scores of bullets per minute. Soldiers called it a "coffee mill gun" because gunners loaded ammunition into a hopper and turned a hand crank to fire the weapon. Several Ager guns saw action at Gaines's Mill, where soldiers reported hearing "the quick popping of a rapid firing gun" above the din of battle. The Agers had little effect at Gaines's Mill but had far more significant influence in inspiring inventors to create evermore devastating weapons and usher in the age of quick and efficient wholesale destruction that is the hallmark of modern technological warfare.